Camden Riverwalk offers one, two and three bedroom apartment homes in Grapevine, TX just minutes from DFW Airport. Whether you are staying in your apartment for a cozy night in, exploring our resort-style amenities, or venturing out into Grapevine and the DFW Metroplex, you will love your life at Camden Riverwalk! Camden Riverwalk apartments offer a wide variety of floor plans and interior finishes fitting any style. Choose from two distinct finishes: modern mocha cabinets with steel brushed bar hardware in our Vista apartments or cherrywood-style cabinets with round steel brushed knobs in our Estates apartments. All of our apartment homes include details like 9-foot ceilings with crown molding, granite countertops, framed bathroom mirrors, stainless steel appliances, and full-size washer and dryer. Some apartments feature upgrades like side-by-side refrigerators, kitchen islands, hardwood-style flooring, amazing nature views from private, wrap-around patios and balconies, and attached garages. There are additional carports available for monthly rent as well as RV parking. There's no need to leave the oasis of our community on the weekends. Invite your friends and family over to relax by one of our two pools featuring shallow water tanning decks, heated spas. Serve up some hamburgers and hot dogs at our poolside grills featuring an outdoor lounge and fireplace! Then, head indoors to our clubhouse for some coffee at our Flavia coffee station available to residents, shoot some pool or play a game of shuffleboard in our resident gaming lounge, then catch a flick in our private resident theater room! Did we mention the 7-acre, fully stocked catch and release pond with fishing rods to rent? This unique amenity is available for residents' private use. Cancel your gym membership because our high-endurance fitness zones have all the cardio and weight training equipment you need to stay fit. Plus, Camden Riverwalk is home to a private 45-acre park with a 1-mile walking/jogging/biking trail that runs throughout the park. You read that right- imagine yourself going for a morning run or walking Sparky in your own private nature park. 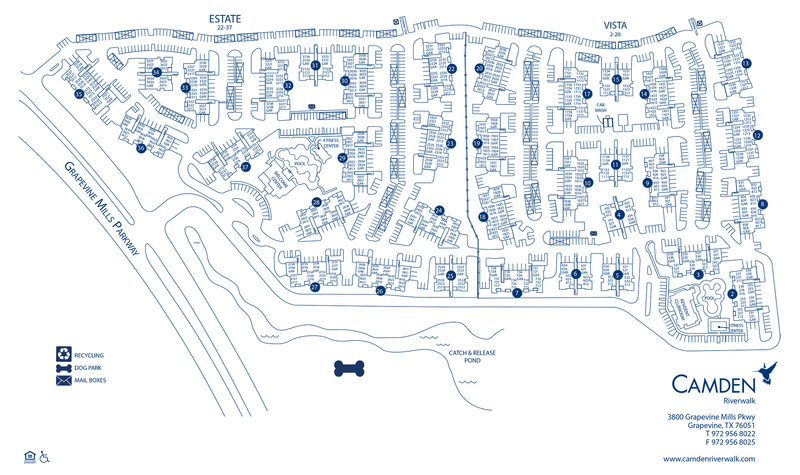 We also have an off-leash dog park that's perfect for your pooch to get exercise and socialize. Grapevine Mills Mall is right around the corner- literally 1.5 miles from our apartment homes- where you can shop, dine and be entertained all day long. We're also only 3 miles to Grapevine Lake and 20 minutes to Lake Lewisville for a day of outdoor fun. Take the family to Great Wolf Lodge and Gaylord Texan for some fun and entertainment, just a short 10-minute drive. Commuting into Dallas or Fort Worth? Don't sweat, our location has you covered! Camden Riverwalk is right off 2499, which gives you direct access to Highway 121 and Interstate 635. Plus, we are less than 5 miles from DFW airport making travel a breeze. Are you ready to move in yet? At Camden Riverwalk, we have thought of it all so you do not have to! Come see for yourself and make an appointment today. All first and second floor apartment homes include garages! Carports are included in select apartment homes and are available for rent for $10-$25 per month.